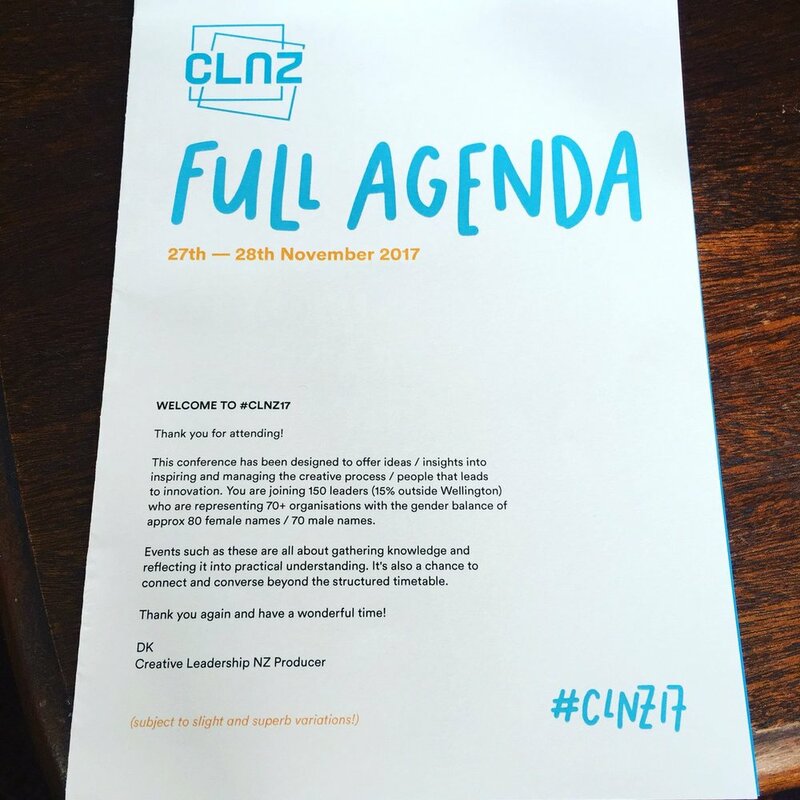 Hollie crafted a wonderfully on-brand brochure and chocolate wrapper design for the Creative Leadership NZ 2017 conference. With little steerage and an open brief, the resulting designs were definitely superbly aligned with the event. All delivered on time with clear communication - looking forward to our next collaboration! Would you like to work together on something similar? Creative Leadership NZ (CLNZ) was a two day conference of ideas and insights into inspiring and managing the creative process and people which leads to innovation. The conference was imagined and developed by justadandak.com, founder of the Creative Welly initiative and licensee and producer of TEDxWellington, who asked me to create the conference’s agenda brochure and a custom chocolate wrapper for the conference. The conference was focused on creativity and leadership across many industries, therefore the design needed to relate to the topic while remain accessible and engaging for all attendees. I was given full creative license to decide both the format and design for the agenda brochure. 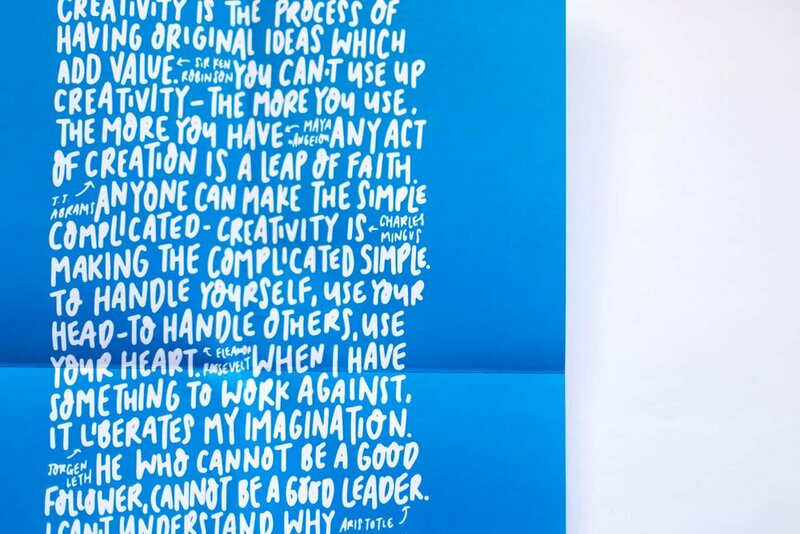 I chose to create an A3 page which folded into a brochure format with the agenda information on one side, and a poster with the inspirational creativity and leadership quotes that DK had been using and sharing alongside the conference promotion on the other. This allowed for a practical, tactile and engaging piece that attendees could both utilise throughout the conference and take home with them as a reminder of the two days and the learnings from the experience. I used the same blue colour that DK had been using in his communications and promotions in order to maintain brand consistency, used clear, structured typographic hierarchy to make the mass of information easily digestible, and injected some fun and intrigue to represent the curious and experiential nature of the conference through hand-lettered elements. Wellington Chocolate Factory created a beautiful, unique chocolate for the CLNZ event, and DK asked me to create a custom, branded wrapper for the bars and decide on the name. The general layout of the wrapper was dictated by the predetermined template from Wellington Chocolate Factory, so I created a hand-lettered graphic in the same style as the brochure for the front of the wrapper, and also continued the blue colour from the rest of the brand to this piece. The chocolate was intended as a boost for attendees throughout the duration of the conference, so I named the bars “Sweet Inspiration” as a fun reference to the conference, it’s theme, and the chocolate itself. Highlight video from the conference by Empire Films featuring the brochure lettering & design. READ the Creative Leadership NZ event review from DK here.